Enjoy perfectly brewed coffee, anytime. 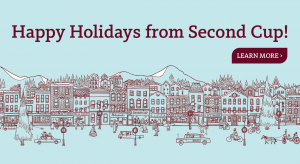 Second Cup Canada invites everyone to enjoy the simple pleasures of a small town holiday at Second Cup! Second Cup is inspired by cozy Canadian Winters and is the ideal spot to savour this season, especially during Black Friday Canada 2014! You can head into your local Second Cup Canada location from Black Friday November 28th through to November 30th, 2014 and enjoy the Black Friday Canada 2014 discounts. You will be able to save up to 50% off on select Holiday merchandise. This merchandise would make excellent gifts, stocking stuffers or maybe just a little something for yourself. Click here to find a Second Cup Canada store near you to enjoy this Black Friday Canada 2014 sale. 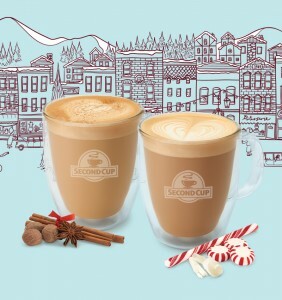 Warm up during your Canadian Black Friday shopping with this new Second Cup Canada Promotion! You can head into your local Second Cup Canada Cafe any Tuesday until January 3rd, 2015 to take part in their Canadian Black Friday Promotion! Ontario, Quebec and British Columbia residents can enjoy a medium handcrafted Latte like the Candy Cane latte for only $2.95. All other Canadian residents can enjoy a large handcrafted latte like the Eggnog Latte for only $3.49! This Pre Canadian Black Friday Second Cup Canada Offer is not valid in Canada. Click here to check out the Second Cup Canada Latte Tuesday Black Friday Promotion! 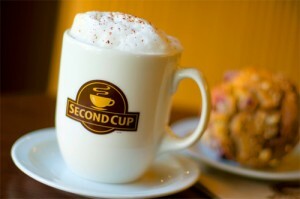 Canadian Black Friday 2013 is being celebrated by Second cup! Enjoy a Free Upsize! Purchase a small or medium sized beverage of your choice and Second Cup, in honour of the 2013 Canadian Black Friday, will up it to the next biggest size at no additional cost to you! This offer is valid from 6:30AM to 12:00PM. Unfortunately, this offer does not apply to kids size or bottled beverages. If you like to sleep in, don't fret! You can get any medium size latte for only $2.95 between 12:00PM and 9:00PM. Shop this 2013 Canada Black Friday with a Latte in hand! It'll keep your spirits and energy level high while taking in all the exceptional sales this year! I am excited! Enjoy a FREE UPSIZE! Purchase a small or medium sized beverage and receive the next biggest size at no additional cost. *Offer valid from 6:30AM - 12:00PM. Offer does not apply to kids size or bottled beverages. Get any medium size latte for only $2.95! *Offer valid from 12:00PM - 9:00PM.